So last week I went to film the European Blackjack Open in London after being invited on a freeroll by Poker Heaven, where I used to play poker a couple of years ago. It turned out to be a really fun day. There were 14 other entrants, and I was pleased to discover they were mostly on a similar level to me, where they had read a few charts before hand and perhaps vaguely understood tournament strategy, but not too much beyond this. Most of the players played poker so we had plenty to chat about. I think I was knocked out of my heat in about 6 hands (you only played 10). Sigh, I lost 4 "flips" out of 6 so no shot at the €5,000 prize for me. Ironically the guy that ended up winning was the only player I noticed who lacked any knowledge of blackjack strategy, ie. he did stuff like standing on 15 with the dealer showing 10, and hit on 12 with the dealer showing 6, not to mention his betting made no sense, he had a chance to bet the minimum and go through the heat as best runner up, but he decided to bet a random amount and fortunately for him he won. Skill game then! 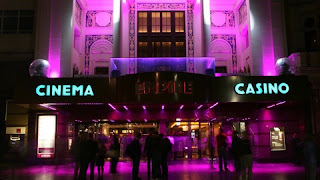 After a few drinks at the Casino at the Empire, where it was held (where they still have WSOP-E posters plastered all over the place, might want to take those down now chaps. How they ever held this tournament here is beyond me, it's bloody tiny, the whole casino is probably 1/10 the size of the Amazon Room at the Rio), we headed out for this absolutely lush meal at a French Restaurant. I was a little bit cheeky ordering the Fillet Steak, with Poker Heaven picking up the tab, and we all seemed to have more than our fair share of red-wine, but it was trés bien! After the meal we all drunkenly headed to this karaoke place called "Karaoke Box". You all get put in a large booth and they bring drinks to you when you push the button (I need to get one of those installed at home!) I kind of like karaoke as it gives me a chance to rap, I tend to roll out one of the classics (This time I gave Boom! Shake the Room a twirl) and then freestyle the last verse. It went down pretty well, although freestyling is a lot more difficult when you're wasted, so I'm sure I jumbled my words here or there. After the karaoke bar I headed off with one of the guys, called Karim, and we ended up getting on a bike-with-a-carriage to take us to the bar he was taking us to (sounds kind of gay now I'm typing it, but it wasn't!). A couple of minutes later these two European guys came up to us and started drunkenly hugging us. I was thinking "this is a bit weird", and the next thing I knew Karim was chasing after them down the street. I padded myself down and nothing was gone, and he had his laptop with him but it was in the carriage which held on to, so I was a bit confused. It turns out they nicked his £3k watch though, sigh. On top of that he had a gash in his leg after hitting a car whilst chasing them. So he called the police and we had to give a description of what happened and stuff, and he ended up having to take an Ambulance to get stitches in his leg. So a bit of an epic fail of an ending to the night, and I feel bad for Karim, but I still had an awesome time all in all (I didn't feel awesome the next day, ugh!). 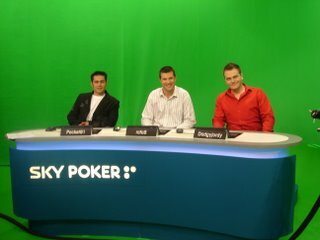 Later today I'm heading back down to London to appear as an analyst on Sky Poker's "Sky Roller" show at 8pm. It's a 4-hour long live show, so I'm pretty nervous, but I'm looking forward to it! I believe I'm essentially analysing hands from two MTTs that are being played at the time on Sky Poker, with random chat and banter inbetween. Anna Fowler and Tikay will be presenting which is cool because I actually met Anna at the EBO I talked about above, as she was presenting that too, and she's really nice and we got on well. I've known Tikay since I first got started in poker, and it's always good to chat with him, so it should be good fun. If you are interested in watching it's on Channel 865 on Sky, or you can watch the channel via this link from the Sky Poker website. It looks like some good changes have been made to the PokerStars client, which have sped up dealing time in SNGs, MTTs and Ring Games. The start time for 2-18 man SNGs has also been reduced. Regular and Turbo SNGs with these number of entrants now begin after 20 seconds, a big decrease from the 60 seconds they were before (Hyper-turbos now start in 10 seconds). I'm definitely happy about getting rid of this dead time, as those 40-seconds for every SNG soon add up. The increase in dealing speeds should also mean getting in extra hands per hour, which should be a good thing in relation to increasing ROI a little, although I'll be keeping an eye on how many tables I can manage at the new speeds! It's quite weird watching all-in showdowns for the time being, as I became so accustomed to their previous speed. Now the turn and river just go boom boom. At least it speeds up the pain when you get sucked out on, much like pulling off a plaster. In truth, watching showdowns is a waste of time an emotion anyway, so this is definitely a positive change. Read the full announcement about the changes here. 2 Comments to "Television appearances + PokerStars Speed"
Nice blog man, keep up the good work james! 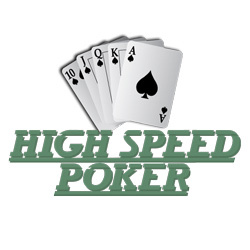 would really appreciate if u could add my poker blog to your list at the side. Cheers mate, GL at the tables!! Congrats for your blog and achievements at the table. Just wanted to tell you these guys tried to steal you "a la Ronaldinho". It's fairly common in Barcelona among pickpockets. They wait for drunk tourists to be all happy and come up to them, hugging them and getting the best of them. Best of luck for you and family. Take care. June Review and pretty busy time ahead!